Welcome to Down On The Street, where we admire old vehicles found parked on the streets of the Island That Rust Forgot: Alameda, California. We tend to think of the Ford Maverick as a pure Malaise Era vehicle, and the two '74s we've seen in this series (this one and this one) reinforce that impression. Don't forget, though, that the Maverick first hit the showroom floor in pre-Malaise 1969; I've managed to find an early example on the island for today. The Maverick was built on the aging Falcon chassis, with the Falcon nameplate getting moved over to the mid-sized Fairlane line for 1970, where it was used on the cheapo stripper models. The Maverick had the same suspension design- leaf springs and all- that made the early Mustangs handle so badly from the factory. 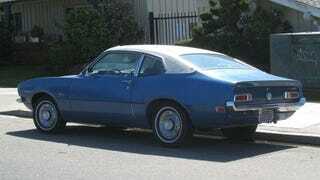 Still, the Maverick was cheap ($1,995 in 1970), simple, and worked just fine as basic transportation. Look at it this way: for just $150 more than the '70 Beetle, you could get a traditional rear-drive/water-cooled American coupe. Look, it's the '69 Dodge A100 van on the same block! That's the way Alameda works; surviving old machinery wherever you turn. This Maverick is on the rough side, but it's being used for transportation every day and still getting the job done after 38 years.